Lesley Charnock was born in 1952 and grew up in Cape Town, South Africa. 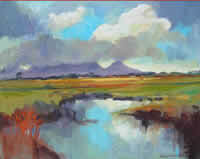 In 1972 Lesley Charnock studied Fine Art at the Cape Technicon under the tutelage of Herbert Coetzee. For many years she studied oil painting with the late Joe Osser at the Green Point Art Centre in Cape Town. In 1988 Lesley Charnock went to the Ruth Prowse School of Art in Cape Town and studied life drawing and oil painting with Ryno Swart. Lesley Charnock is well known as an enthusiastic and inspirational art teacher. For many years she has taught drawing and painting. Many of her students have gone on to enjoy commercial success with their own work. Lesley Charnock is regularly invited by various art societies as a guest artist to demonstrate painting. She has illustrated three popular children’s books. For eight months of the year, Lesley Charnock runs one day workshops in portraiture, still life and landscape painting. She also takes groups of students on five day drawing & painting holidays to picturesque Cape country villages. Lesley Charnock has had solo exhibitions and taken part in many group exhibitions. 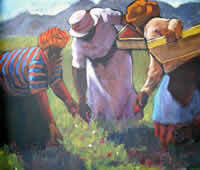 Her work is sold through several top galleries in and around Cape Town and other centres in the Cape.